The first broadcasts were in 1981 on 1404 kHz, 214 metres medium wave. They could be heard on Sunday afternoons but suffered from poor reception. Later, in 1982, the open access community station, Our Radio, offered the use of their transmitter. DBC then switched to Friday nights on 103.8 FM. 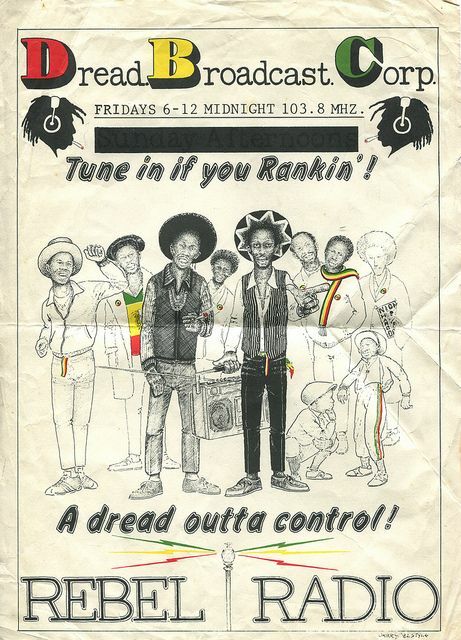 This wasn’t just the music reggae fans wanted to hear, but it was presented the way they wanted to hear it. DJs like Lepke and Chuckie had served their apprenticeship with sound systems and their shows would also include plenty of reverb, echo, sirens and other effects. DBC later added shows featuring funk, R & B, soca and jazz. Other DJs included Lepke’s sister Margaret (The Rankin’ Miss P) and Neneh Cherry. DBC also made their mark on the chests of Londoners, with the production of T-shirts and badges. These became available from shops all over London and became quite the thing to be seen in, with many people wearing them who’d never heard the station! By Christmas 1983, DBC had only been caught twice. After that, they were caught twice in 6 weeks. Despite this, they decided to expand to broadcasting live, 12 hours a day, 7 days a week. They now had listeners well outside of London and figures were estimated to be as high as 100,000. Later in 1984, DBC attempted their most ambitious project yet, to broadcast live from a sound system in a park in Harlesdon. They also broadcast live from that year’s Notting Hill Carnival. This turned out to be the last transmission from DBC as they disappeared soon after. The Rankin’ Miss P had been offered a show on Radio 1, and others had just had enough. Those that wanted to carry on re-emerged as JBC. David Kats recalls the record stall on Portobello Road (Golborne Road end) back in the 1980's.